The Agricultural Model Intercomparison and Improvement Project (AgMIP) is a major international effort linking the climate, crop, and economic modeling communities with cutting-edge information technology to produce improved crop and economic models and the next generation of climate impact projections for the agricultural sector. The goals of AgMIP are to improve substantially the characterization of world food security due to climate change and to enhance adaptation capacity in both developing and developed countries. Analyses of the agricultural impacts of climate variability and change require a transdisciplinary effort to consistently link state-of-the-art climate scenarios to crop and economic models. Crop model outputs are aggregated as inputs to regional and global economic models to determine regional vulnerabilities, changes in comparative advantage, price effects, and potential adaptation strategies in the agricultural sector. Climate, crop model, economics, and information technology protocols are presented to guide coordinated AgMIP research activities around the world, along with cross-cutting themes that address aggregation, uncertainty, and the development of Representative Agricultural Pathways (RAPs) to enable testing of climate change adaptations in the context of other global trends. The Coordination Team is led by Joshua Elliott and Christoph Müller and welcomes questions, comments, requests, ideas, project proposals, or criticisms and can be contacted here. US forests have been a net carbon sink for the past 50 years, sequestering 500–800 million tons of CO2 per year for the past 20 years. This sequestration has benefited the global climate system, offsetting 10–15% of gross GHG emissions in the US. Recent projections from the US Forest Service, however, suggest that the ability of US forests to sequester carbon may be imperiled over the coming decades, in part due to adverse climate impacts on forests, as well as the expansion of cropland. While there is nascent research into the future capacity of forest carbon sinks, many analyses either do not incorporate market responses to biophysical shocks; are static, failing to account for dynamic adjustments in harvest schedules or investments; do not address climate change, which will likely cause increased forest disturbance; or are deterministic and ignore the impact of future uncertainty on optimal decision making in the presence of significant irreversibilities and risk aversion. vegetation projections (a) Mci-modeled potential vegetation under observed 1961-1990 cliamte. (b) mci-modeled potential vegetation under projected 2071-2100 climate where any of nine general circulation model-emissions scenario combinations projects a change. biomes, in (a) and (B), from poles to equator: ice (ic), tundra and alpine (UA), boreal conifer forest (bc), temperate conifer forest (TC), temperate broadleaf forest (tb), temperate mixed forest (tm), temperate shrubland (ts), temperate grassland (tg), desert (de), tropical grassland (rg), Tropical woodland (rw), tropical deciduous broadleaf forest (rd), and tropical everygreen Broadleaf forest (re). (c) confidence of biome projections calculated from fraction of general circulation model-emissions scenario combinations that project the same time of biome change. In a new project, we're extending the FABLE (Forest, Agriculture, and Biofuels in a Land use model with Environmental services) model to more accurately capture forestry management decisions. Forests are managed differently in different regions from intensive management in plantations forests to continued old growth extraction in boreal zones to selective logging with significant collateral damage in the tropics. Over 60% of the world’s timber harvests occur in temperate and boreal zones, which may experience increased forest fire activity. Adapting management to rising forest fire probabilities, or extreme fire seasons, could affect global prices and consequently management in the fast-growing plantation regions of the subtropics. Disaggregating FABLE by ecological zones will account for factors such as forestry rotations, management intensity, and the development of fast-growing plantations. Further, we plan to use a dynamic global vegetation models to estimate uncertainties in timber yields due to climate change. Impacts from climate change will differ substantially by region. Boreal zones are expected to experience the largest shocks, although the species in the tropics are potentially the least adaptive and are more susceptible to smaller shocks. We will model natural disturbances due to forest fires as shocks to forest stocks, using the MC1 dynamic global vegetation model for these estimations. The change in timber yields will be assumed to be proportional to changes in net primary productivity projected by the MC1 model. We will also incorporate improved estimates of land use change and land availability. Changes in the potential area of land available for forests to grow will be assumed to be proportional to changes in the ecological zones produced by MC1. While MC1 may predict a large increase or decrease in the area of particular species, the actual area of the species will be a function of economic conditions and crop yields. 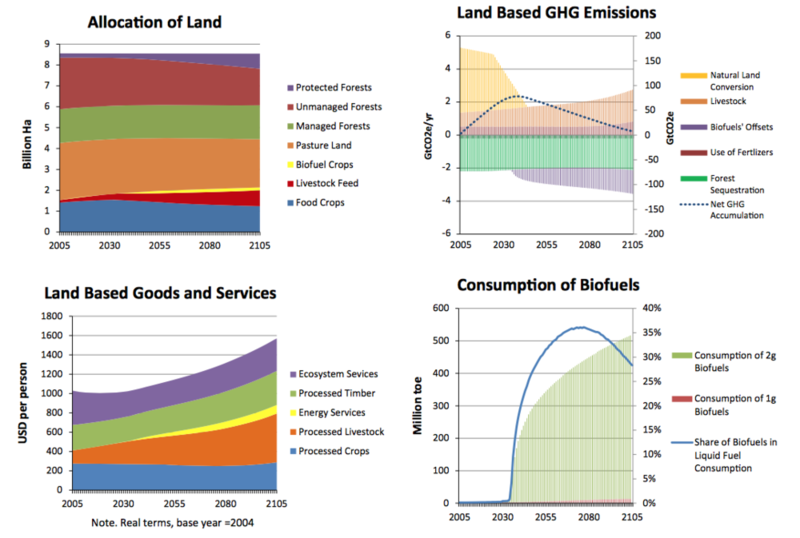 Global land use research to date has focused on quantifying uncertainty effects of three major drivers affecting competition for land: the uncertainty in energy and climate policies affecting competition between food and biofuels, the uncertainty of climate impacts on agriculture and forestry, and the uncertainty in the underlying technological progress driving efficiency of food, bioenergy and timber production. The market uncertainty in fossil fuel prices has received relatively less attention in the global land use literature. Petroleum and natural gas prices affect both the competitiveness of biofuels and the cost of nitrogen fertilizers. High prices put significant pressure on global land supply and greenhouse gas emissions from terrestrial systems, while low prices can moderate demands for cropland. In this study, we assessed and compared the effects of these core uncertainties on the optimal profile for global land use and land-based GHG emissions over the coming century. FABLE integrates distinct strands of agronomic, biophysical and economic literature into a single, intertemporally consistent, analytical framework, at global scale. Our analysis accounted for the value of land-based services in the production of food, first- and second-generation biofuels, timber, forest carbon and biodiversity. We have modeled uncertainty in future fossil fuel prices with discrete time, discrete state-space, time-homogenous Markov chain methods. The stochastic process is characterized by a state space and transition matrix describing the probabilities of particular transitions. The states represent whether world is on high, middle (reference path), or low price paths in a given time period. In our modeling, these are exogenous states because we will be using price data provided by EIA and extrapolated into the future. We found that by mid-century, slowing population growth, coupled with ongoing agricultural productivity growth will likely bring an end to large scale cropland conversion, after which point the worlds land resources will likely become a net carbon sink. There is great uncertainty about the allocation of the worlds land resources in 2100. We have compared the land use impacts of anticipated uncertainty in climate impacts, climate regulation and energy prices and find that energy prices are the most significant source of uncertainty in global land use in 2100. High energy prices encourage more land conversion for biofuels and raise the cost of cropland intensification, while low energy prices have the opposite effect. Model scenarios. Panels (a) and (b) pertain to climate change impacts. Panel (c) pertains to GHG regulatory scenario and panel (d) shows energy price scenarios. Steinbuks, Jevgenijs, & Thomas W. Hertel. "Energy prices will play an important role in determining global land use in the twenty first century. "Environmental Research Letters 8, no. 1 (2013): 014014. Steinbuks, Jevgenijs. "Energy prices will drive global land use in the 21st century." Environmental Research Web, April 2013. Insight Article. The Inter-Sectoral Impact Model Intercomparison Project uses a community-driven modeling effort in order to bring together impact models across sectors and scales for creating consistent and comprehensive projections of the impacts of different levels of global warming. The goal is to provide cross-sectoral global impact assessments, which is based on the Representative Concentration Pathways (RCPs) and Shared Socio-Economic Pathways (SSPs) scenarios. Based on these common background scenarios, a quantitative estimate of impacts using policy-relevant and society-focused metrics, and uncertainties for different sectors and from multiple impact models will be derived. Hotspots where severe impacts are experienced in two (orange) and three (red) overlapping sectors. Studies of mitigation pathways and strategies show that limiting global warming to 2° is much more ambitious and costly than a 3°. However, little is known of the quantitative differences between impacts of different levels of global warming, not to mention how impacts in different may interact and potentially amplify one another. In order to provide an estimate of the differential impacts of climate change, research is required to improve our fragmented knowledge and large uncertainties. A global, cross-sectoral, quantitative synthesis of climate impacts, including consistent estimates of uncertainties, is missing so far. Furthermore, a better, quantitative understanding of impacts will enable the derivation of efficient impact emulators, which can in turn be employed to enhance integrated assessment studies. Gerald C. Nelson et al. "Assessing uncertainty along the climate-crop-economy modeling chain." Submitted to PNAS ISI-MIP special issue, January 2013. Franziska Piontek et al. "Leaving the world as we know it: Hotspots of global climate change impacts." Submitted to PNAS ISI-MIP special issue, January 2013. The allocation of the world’s land resources over the course of the coming century has become a pressing research question. Continuing population increases, improving, land-intensive diets among the poorest populations in the world, increasing production of biofuels and rapid urbanization in developing countries are all competing for land even as the world looks to land resources to supply more environmental services. The latter include biodiversity and natural lands, as well as forests and grasslands devoted to carbon sequestration. And all of this is taking place in the context of faster than expected climate change which is altering the biophysical environment for land-related activities. This combination of intense competition for land, coupled with highly uncertain future productivities and valuations of environmental services, gives rise to a significant problem of decision making under uncertainty. The issue is compounded by the inherent irreversibility of many land use decisions. The goal of this study is to determine the optimal profile for global land use in the context of growing commercial demands for food and forest products, increasing non-market demands for ecosystem services, and more stringent greenhouse gas (GHG) mitigation targets. We do so by developing a new model, nick-named FABLE: forest, agriculture, and biofuels in a land use model with environmental services. This model determines the optimal allocation of scarce land, both across competing uses as well as across time. While market failures, including ill-defined property rights, poorly developed land markets, lack of information, and credit constraints preclude such a path from being achieved in reality, this optimal path is a useful point of reference for those seeking to influence patterns of global land use. The resulting long-run, forward-looking, computable partial equilibrium model, covers key sectors drawing on the world’s land resources, and incorporates growing demands for food, renewable energy, and forest products, as well as non-market demands for ecosystem services. We also consider alternative GHG constraints, as well as the potential impacts of climate change itself on the productivity of land in agriculture, forestry and ecosystem services. Our baseline reflects developments in global land use over the 10 years that have already transpired, while also incorporating long-run projections of population, income and demand growth from a variety of international agencies. The model baseline suggests that, even in the absence of GHG regulations, deforestation rates associated with cropland expansion decline along the optimal land-use trajectory in the medium term. This is important, since deforestation accounts for a large share of current global GHG emissions. In the long term there is a significant expansion of the livestock sector, driven by increasing per capita incomes, and this is fueled by increasingly intensive production practices. The area of protected natural lands, which deliver valuable ecosystem services, also increases strongly in the long run. However, this finding is sensitive to the choice of social discount rate. A higher rate of discount results in a sacrifice of forest cover and ecosystem services in favor of more immediate delivery of services from food and energy consumption. Along the baseline, the consumption of biofuels increases rapidly after second generation biofuels become commercially viable in 2035, and provides for about a third of total liquid fuel consumption by the end of this century, along the optimal path under our baseline scenario. 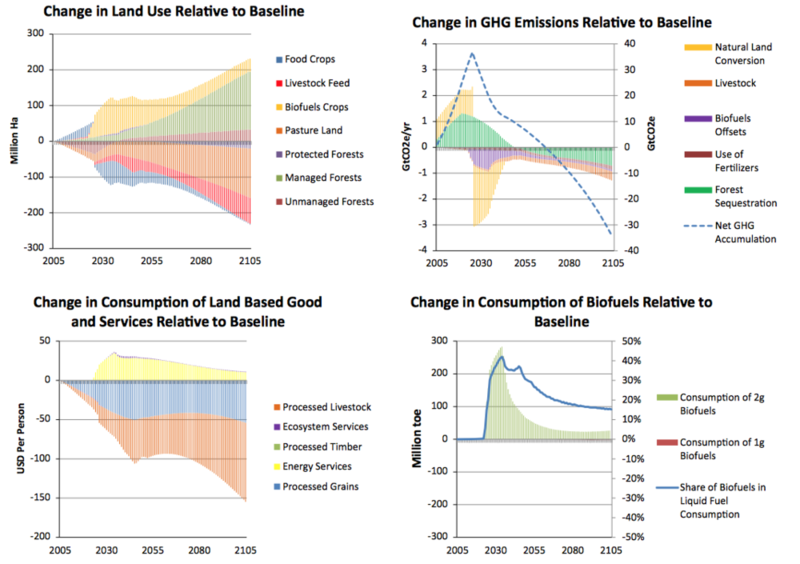 We consider three counterfactual scenarios aimed at capturing the most important sources of uncertainty associated with this long run trajectory for global land use, climate impacts on agriculture, energy prices, and global GHG emissions regulations. Adverse climate impacts on crop yields curtail food production, requiring additional cropland and encouraging additional fertilizer use, thereby leading to higher GHG emissions. Energy prices affect the optimal deforestation rate as well as the overall amount of land used in agriculture. By mid-century, cropland area increases sharply under higher energy prices, due to the incentive for increased biofuel production as well as higher fertilizer prices which raise the cost of intensification. Substantially more deforestation occurs under this scenario and the increased GHG emissions from land use change outweigh the emissions fall from displacement of petroleum consumption by biofuels and declining fertilizer use. When we also require the world’s land base to deliver land-based GHG abatement, the pressure on global natural land resources becomes even more significant. While the introduction of the land based GHG emissions constraint leads to a significant reduction in GHG emission flows over the twentyfirst century, its effectiveness is eroded by a substantial increase in GHG emissions after the policy is announced, but before the policy is actually implemented. This mimics the ‘green paradox’ found in other areas of environmental regulation. Since such pre- announcement seems inevitable from a political-economic perspective, it is an issue which deserves greater attention. Indeed, we find a leakage rate of 56%, which is very high and threatens to undo most of the GHG mitigation benefits of such a policy. When all three ‘scenarios’ are simultaneously realized, the world’s land resources face a ‘perfect storm’ in which the cost of agricultural intensification is higher, biofuels expand their area, additional cropland is needed to offset the adverse impacts of climate change, and climate regulation also places new pressures on land availability for food. In this case the optimal path of food consumption is significantly lower, highlighting the potential for intense competition for land in the production of the world’s food, fuel and environmental services over the twentyfirst century. Steinbuks, Jevgenijs, and Thomas W. Hertel. "Confronting the Food-Energy-Environment Trilemma: Global Land Use in the Long Run." Environmental and Resource Economics (2012): 1-26.